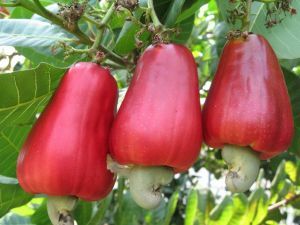 Cashew, scientific name Anacardium occidentale, is a tree in the family Anacardiaceae which produces a seed that is harvested as the cashew nut. Its English name derives from the Portuguese name for the fruit of the cashew tree, caju, which itself is derived from the indigenous Tupi name, acajú. Originally native to northeastern Brazil, the tree is now widely grown in tropical climates for its cashew apples and nuts. The cashew nut is a popular snack and food source. The fruit of the cashew tree is an accessory fruit. What appears to be the fruit is an oval or pear-shaped structure, a hypocarpium, that develops from the pedicel and the receptacle of the cashew flower, called the cashew apple, better known in Central America as marañón, it ripens into a yellow and/or red. It is edible, and has a strong "sweet" smell and a sweet taste. The pulp of the cashew apple is very juicy, but the skin is fragile, making it unsuitable for transport. In Latin America, a fruit drink is made from the cashew apple pulp which has a very refreshing taste and tropical flavor that can be described as having notes of mango, raw green pepper, and just a little hint of grapefruit-like citrus. The true fruit of the cashew tree is a kidney or boxing-glove shaped drupe that grows at the end of the cashew apple. The drupe develops first on the tree, and then the pedicel expands to become the cashew apple. Within the true fruit is a single seed, the cashew nut. Although a nut in the culinary sense, in the botanical sense the nut of the cashew is a seed. The seed is surrounded by a double shell containing an allergenic phenolic resin, anacardic acid, a potent skin irritant chemically related to the better-known allergenic oil urushiol which is also a toxin found in the related poison ivy. Properly roasting cashews destroys the toxin, but it must be done outdoors as the smoke (not unlike that from burning poison ivy) contains urushiol droplets which can cause severe, sometimes life-threatening, reactions by irritating the lungs. People who are allergic to cashew urushiols may also react to mango or pistachio which are also in the Anacardiaceae family. Some people are allergic to cashew nuts, but cashews are a less frequent allergen than other nuts or peanuts. cashew apples are remarkably perishable. Unless frozen or kept at very cool temperatures, the apple only lasts for 5 days once plucked from the tree. Ripe cashew apples are bright yellow or red in color. Cashew Apple the taste is quite good. The waxy skin, watery and crisp texture resembles a bell pepper, but the taste is sweet and a bit citrusy. Some custard apples, however, are astringent and make your mouth chalky as if you’ve eaten a plantain. The cashew apple’s iron, high vitamin C (5 times as much as oranges), phosphorous and calcium content offer medicinal benefits.